November 18th: Third National History Forum. Click here for more info. 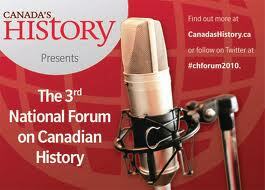 Canada’s History is proud to present the 3rd National History Forum live from Ottawa November 18th. The 2010 Forum brings together an exciting group of international speakers to explore Canada’s history and citizenship understanding in a world context. Canada’s History is now accepting registration for the National History Forum. You can attend the event in person or follow our online broadcast live from Ottawa. Registration to attend in person is $50 which includes lunch for the day. Students are $20 and it is free to attend online. To register to attend in person or online, click here.